Like many of you, I get sick and tired of hearing industry “buzzwords” that should have meaning but often don't. In AV today, the word is “solution.” By definition, a solution is the act of solving a problem or a question, as in “the situation is approaching solution.” Thus, the word “solution” is overused, nonetheless I have in my possession the Canon REALiS WUX400ST pro AV short-throw compact installation LCOS projector. After a thorough review, I confidently believe it is a true solution. From the beginning, we have had projectors with long-throw capabilities and wide-angle lenses, but true short-throw close focus projectors as a high performance solution has been a development of recent times. This being the case, we must ask ourselves if this is going to become a trend in AV design or a nice option as a footnote in a projector manufacturer’s line-up. If we look at the latest market research we see that there are three factors of significant growth in projection. One is that the sweet spot of light output is now in the 3,000- to 4,000-lumen range. In terms of resolution, XGA has ruled the roost for years driven by the relatively low resolution requirements of the educational community — but this is now migrating to higher resolutions since source material at those higher resolutions is more affordable and more readily available. Last but not least we are seeing significant growth in the use of short-throw projectors. The question jumps out at you. Is there a projector that excels in all of these growth areas? The answer is yes: it is Canon REALiS WUX400ST. Here’s why: It is a compact installation projector that uses LCOS technology featuring the highest fill factor in the digital display industry, with a high-resolution of 1920 x 1200, producing 4000 lumens of light output, and features a .56:1 short-throw optic. Let’s state at the outset: no matter what a specification says, if the projector does not produce a stellar picture, all else is gilding the lily and simply marketing chatter. In short, it is and always will be about the image on screen and the WUX400ST does not disappoint in any sense. Based on LCOS technology that uses the best of both reflective and transmissive elements in the core chip, you get excellent resolution and high contrast for two basic reasons. As noted earlier, LCOS has the highest fill factor of any digital display technology so the active area on the screen is maximized while minimizing the screen door effect of other display technologies, and coincident with that there is the unparalleled quality of the Canon optics that go a long way to improve contrast. While we are still inside the projector I want to address the concept of color processing. You can have great optics and the most advanced core chip technology, but what if the color processing is inferior? To the first order, this is related to color bit depth stated as so many bits. For the uninitiated, a bigger number is better. Many projectors use 8 bit processing and yet others are more advanced and use a 10 bit system. The folks at Canon take their resident bit depth very seriously and increase it to a class leading 12 bits of processing power incorporating an advanced color processing system that is very sophisticated in terms of how it “handles” each color. In side-by-side comparisons with projectors using lower bit depth processing, the difference is quite noticeable. Combine the film-like quality of LCoS with advanced color processing and excellent contrast, and this produces image fidelity that is fully optimized in terms of replication content in an accurate manner. Excellent image quality is the price of entry in the upper echelons of this category, but we would be remiss if we did not speak of the physical nature of short-throw capability in some detail. The specification states that this is a .56:1 lens and that tied into Canon quality is quite impressive. This translates into a projector that can produce a 100-inch image from as little as 4 feet away. Pretty impressive numbers, but I urge you not to stop there. What is truly unique, and takes this projector to a completely different level, is the mechanical lens shift capability that provides for the image to be raised vertically from 0 to 75% and horizontally plus or minus 10%. 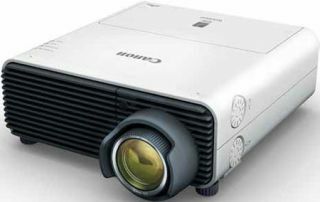 This compares with other short-throw projectors on the market that have as little as 50% vertical lens shift. To any the skeptics concerned about how Canon’s extreme lens shift will affect image quality, as a point of reference, in our testing with both cross hatch and geometry test patterns, the WUX400ST performed extremely well with virtually no distortion. Impressive as those numbers are, imagine what you can do with this in terms of a practical solution to problems you could not address before. You can now tuck the projector underneath the lip of a traditional conference table and literally take the projector out of the environment. Just try finding a better way to create a high quality image of 100-inch or larger for the price and the added benefit of no visible display device to distract you from the interior design. Another one of my favorite applications is to mount a series of these projectors along the ceiling or hallway and, thanks to the built in edge blending with an overlap capability of 0 to 960 pixel horizontal and 0 to 600 pixel vertical, create a continuous and seamless series of images as far as you want. And thanks to the aforementioned short-throw capabilities, the viewers are out of the light path of the projectors. Even for those of us who are, shall we say, less imaginative, there are still benefits. You can now mount the project closer to the screen in front or rear projection in a more traditional sense while reducing installation time and costs (long cable runs). One can then simply fine tune with manual lens adjustment to fit perfectly on the screen. One final point on lensing is the fact that the .56:1 lens has an f stop of 2.7. This feature facilitates the use of the projector on curved or spherical surfaces—as this allows the projector to remain in focus as the screen surface curves. To test this we placed the projector on a curved screen and measured focus and uniformity in the center of the screen and on the curved extremities. With typical projectors having less depth of field capability, the curved areas become out of focus and with the WUX400ST this was simply not the case. Another useful but unsung tool on several of the Canon REALiS projectors is 4-point independent keystone correction, with “independent” being the critical word. On some other projectors, keystone correction has a tendency to degrade the image in some manner. And although digital keystone correction has improved over the years, by design this feature uses fewer of the available pixels on the display (which should always be avoided if possible). adjusted independently allowing for true diagonal projection.